So, there I was again. My second African peak was on the program. I had arranged to fly to Morocco with Sven Krug in order to climb Toubkal, the country’s highest peak, the highest peak in the Atlas mountain range and also the highest peak in Northern Africa, as one would have to go all the way to Ethiopia to find higher ones. It was raining cats and dogs when I met Sven and Tatiana at the Namur exit of the autoroute. I had taken a taxi to get there, and luckily the driver had dropped me off at a nearby gas station. But even with the shelter that I had in outside pumping area I still got wet (the rain was falling horizontally due to an accompanying storm) and the gas station owner eventually signaled me to come inside for additional protection. Sven and Tatiana arrived with some delay as they also had problems navigating the overflowing streets. And sure enough on the way to the Charleroi airport we had to slow down to less than 50 km/h due to excess water on the road and pure visibility. All the while Sven and I teased Tatiana, because she had to drive back through the awful weather, while we were flying off into the sun (the Moroccan weather forecast predicted sunny conditions at 28 degrees for our arrival). The flight was uneventful except for the fact that I had paid an extra 10 Euros for priority boarding, which enabled me to go through the gate rather quickly, only to be waiting then at the bottom of the gate, because we were not yet allowed on the Tarmac. Why let us go through in the first place, I wonder, to keep up the illusion that the ten Euros bought me something special? The illusion gave way to hard reality when everybody else also gathered at the bottom of the gate and my advance was gone. Got shafted again, I guess. No, not quite, as I was allowed to get extra legroom in the plane’s emergency row. Throughout the flight I saw Sven who sat in the row in front of me talking to a guy who turned out to be a helpful Moroccan and who took care of us once we were on the ground. After Sven got his back (I only had a carry-on) and I had changed some more money, we left the airport with the guy, because he said that his sister could give us a ride to the taxi stand from where we could take a cab to Imlil. She was not there yet, so we walked a bit away from the airport towards a large roundabout, which gave me some time to look around. The airport appeared brand new, but the 100s of taxis parked up front were not. Almost exclusively they were Mercedes taxis of the W-123 or W-124 variety. This was amazing as most were at least 25 years old. I guess, they do their first million kms in Germany and then they get “cashed for clunkers” or I guess they do not get “clunkered” at all and it is just all a scheme and they get actually shipped down to Morocco, where they do another 3 or 4 million kms. Hmm, I guess I had it all figured out. In any case, I was in heaven: Not only did I have two days to do another beautiful mountain, but it was sunny and warm and in the optimal case I would ride an old Mercedes cab up into the mountains. Wonderful!! The guy’s sister finally showed up and we got into her car. Turns out it was not so easy to find the right taxi stand as apparently it had moved and we had to drive around a bit, stop and ask numerous times for directions. But this was not all bad as we got to see a little bit of the city, including the king’s palace and some other impressions of Marrakech. Eventually we found the cab stand and after bidding our friendly drivers farewell, we started talking to a guy at the taxi station. Everybody speaks French here, which really helps a lot, especially in negotiating the right price. It turned out that the guy was some sort of middleman who helped to fill the taxis. Normally, they would put five people in a cab and it would leave when full. But we wanted to leave right away and our friend Imane in Namur had told us that this is a possibility. We would just have to purchase the extra seats as well. She had also informed us that we should not pay more than 180 Dirhams, but the guy now wanted 300 (about 30 Euros). Sven tried to negotiate, but he was not getting through. I really did not care and did therefore not support Sven much in his ultimately fruitless endeavor. I only had 48 hours and I wanted to get to Imlil as quickly as possible. So we ended up paying 300 Dirhams and immediately after paying saw a 100 Dirham note go into the hustler’s pocket and the remaining 200 for the cab driver. Sven scolded me a bit for “supporting the system”. But I argues that 10 Euros is nothing for me and “the hustler only had one arm, for god’s sake.” In a developing country like Marocco that is probably a serious handicap, even more so than it would be in an EU country. So, there we got into the old Daimler, 200 Diesel, 0-100km/h in about 32 seconds and altogether wonderful, very comfortable and pure cult (did I mention that I drove numerous such cars in my younger years). We left Marrakech and as we approached the Atlas mountain range, we saw dark clouds blocking most of the view. Our driver said: Don’t worry, it will be nice tomorrow (he was right), but by the time we arrived in Imlil 90 minutes later it was completely overcast and dark. Night was falling quickly and another taxi was already in place to drive us another 300 meters uphill to the village of Aroumd at 2000 meters, where we would spend the night. Let me give some credit to Sven here, who had taken care of all the arrangements regarding accommodation (Thanks Svennie). The taxi pulled to a stop in front of the village and we climbed up a few stairs and narrow streets to get to the refuge where we were supposed to stay. The village consists of maybe 100 houses and is built on the slop of a hill, which results in most streets being fairly steep. In addition, it was pretty dark as only a few lamps illuminated certain parts of the village (I put on my headlamp once at the refuge). Our room, which was actually on the top floor of a family home (the family we staying downstairs) was clean and equipped in the typical refuge fashion with only a matrass and heavy blankets “ad libitum”. Our room was next to a larger, nicely decorated living room, which also served as our eating room. Hungry we were (it was already 9pm) and after waiting for some time we went downstairs to inquire about dinner. We met the rest of the family, in addition to our driver Houssein. His father, mother, wife and kid as well as some other undefined family members were all there in one single room. We learned that the food would soon be ready but when hearing the muezzin a few minutes later, it became clear to us, that the men would likely go to evening prayer and eat afterwards. Assuming that we would eat at the same time as the rest we went out again to search for the mosque and explore the village a bit. Out in the street we ran into a fair number of people, all on their way to the mosque. Most were closed in traditional Arab drab (or at least in what I associate with typical Arabic customary clothing), and all offered a friendly “bonsoir”. The mosque door was open and we could see many dozens of men participating in the evening prayer. We continued on a bit through the dark streets, but soon went back to our home for the night, because by now we were getting really hungry. Fortunately, the food was served soon thereafter (evening prayer seems to be a rather quick affair) and it was delicious. I had my very first Tajine after a soup and followed by sliced oranges for dessert. All was accompanied by sweet tea. Then it was off to bed and I slept soundly through the night (thanks to earplugs I never learned whether there is a middle-of-the-night-prayer) until about 8am when more food was served, breakfast now, consisting of bread, jam, kiri cheeses and again more sweet tea. After breakfast, we packed up and were soon on our way towards the mountain. We walked at a leisurely pace and were soon passed by numerous mule trains, transporting backpacks and other gear for the gringos who were just hiking with a day pack. There were a few stands along the way, operated by locals and mostly geared towards the gringos. We avoided these tourist traps and reached the refuge at 3200 meters after about 3,5 hours and a 1200 meter gain. In the refuge we were assigned beds in a large dormitory, had some lunch (huge quantities of rice, pasta and salad (which I, always the careful traveler, avoided) and then went up to the roof top to “chill” in the sun. It was only 2pm and we had plenty of daylight left and therefore we decided to head up a bit further, either to explore the path we were to follow the next day or to head up to a col by the name of Tizi (col) Ougane at 3750 meters. We decided for the latter and therefore headed up the valley to the pass. The weather was beautiful but there was still a fair amount of snow on the slopes. Sven pointed out some clouds that were moving up the valley, about half way up to the col. A few minutes later, we looked again, and it seemed that the clouds were quickly dissipating as they reached a certain elevation. It took us about 1.45h mostly on snow to get to the pass, but after only pausing for a short while, I mentioned that I would like to go up a bit further (there was a trail veering of the right from the pass) and wondered if Sven had a problem with that. Sven replied “No, but I will turn around.” I said “Ok, so I will see you at the hut." It was about 4.10 and I declared my turn around time to be 5pm. Off I went, following a clearly discernible use trail that moved a bit to the left and to the right and then up a short gully until it topped out on a ridge which soon gave way to a scree slope which I plodded up in a serpentine fashion. At about 4.50 I reached what I thought was a summit only to find out that it was not the highest point yet. However, the actual top was only another 20 meters away and I crossed a small gap to reach the top of Ras mountain. However, when I looked into the distance I saw another (higher) top with an obvious cairn on top about 300 meters away and separated from where I was by a not too deep gap. Not knowing which was the highest point I decided to head over the other point as well to make sure that I had really tagged the highest point on Ras mountain. I descended into the gap and traversed horizontally across the gap and then ascended the slope to the summit and its cairn. I did not find a summit registry or any proof, but I was sure that this was the highest point, at least compared to the previous two “ summits” I had been to. I was very happy being on top, had beautiful views of the surrounding scenery and Toubkal in the distance and the 2100m elevation gain I had managed that day. After I had taken a bunch of pictures and a quick video for Catherine, it was already a few minutes after five and I quickly headed down to the slope to the pass and then down to the refuge where I arrived about at about 18.30. About 30 minutes before arriving at the refuge I entered the clouds, which by now were more dense and higher up in the valley. But visibility was never poor and I had no trouble finding the way back. Afterthought: I did not learn until weeks later that I had actually climbed two summits that day. The first double summit I thought was just a fore peak is called Ras n’Ouanoukrim and measures 4083m. 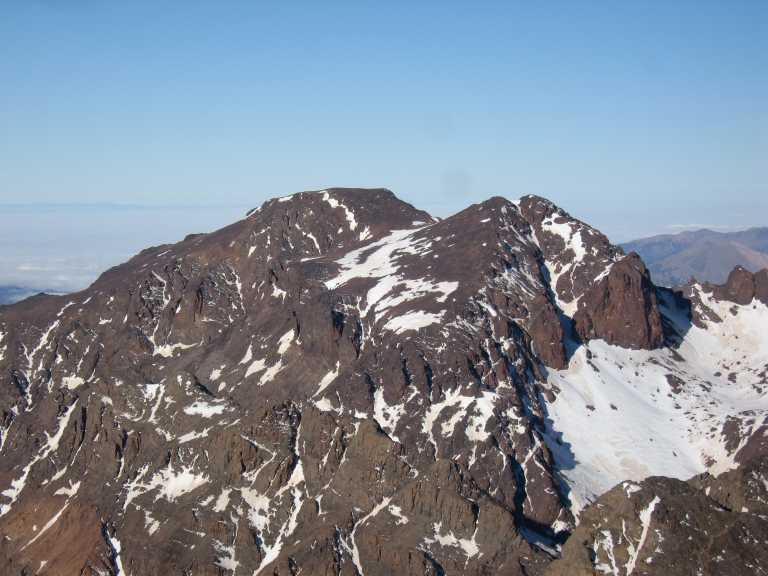 The other one, which I thought to be the main summit, is called Timesguida n’Ouanoukrim and tops out at 4089m. So, they are, respectively, the third and second highest mountain in Morocco. However, I am not sure if they are prominent enough to earn mention as separate summits. In some lists they appear as separate peaks, but in others they appear as two subpeaks of one mountain “complex” called Ouanoukrim. Whatever the case, it was great fun and I am glad I did both.